Retro Refrigerator Buying Guide -- 8 Great Options at Your Fingertips! 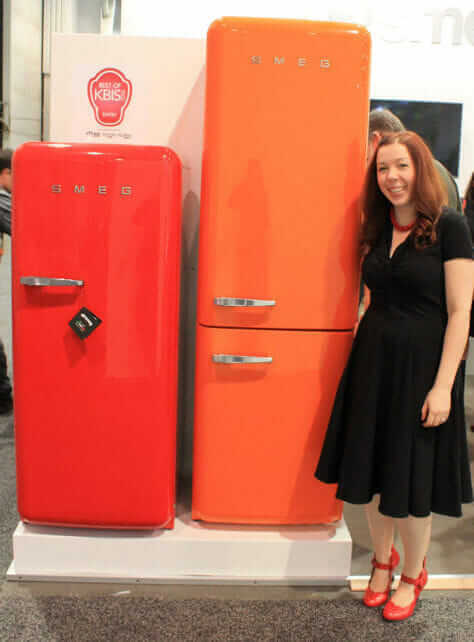 Home » My Retro Refrigerator Buying Guide — 8 Ways to Get the Fridge of your Dreams! My Retro Refrigerator Buying Guide — 8 Ways to Get the Fridge of your Dreams! Kara used a white Big Chill refrigerator when renovated her awesome kitchen, which won our 2015 “The Hard Way” award. 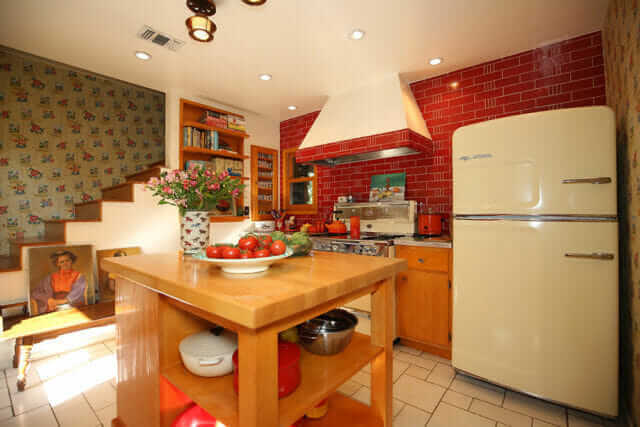 A retro refrigerator can be the absolute centerpiece of your kitchen, and over the past few years as interest in mid century design has boomed, many more options have become available. But this also means that if you’re in shopping mode, your head can quickly start to spin. So, I did the research and created this roundup, as complete as I could make it. In all, I give you eight sources or ideas to consider to get a retro refrigerator. To make this a one-stop shopping guide, I worked hard to deep dive into the real contenders — this is a long story, not cursory. On this blog, finding products and resources to help you renovate, remodel and decorate your home in appropriate retro style is is my sole focus. So, I hunkered down to pull this buying guide together — to make your hunt that much easier. My first possibility for a retro-style refrigerator will likely surprise you, but barring buying vintage, it is hands down, the most authentic choice: Sub-Zero. That’s because Sub-Zero is not an interpretation of mid century refrigerators — it actually has been around for decades. Choose a “Panel Ready” design — buy the panels directly from Sub-Zero or have them custom made by your cabinet maker — the panels then will be “Framed” in metal like the photo to the right. Choose the “Classic Louvered Insert” grille ala the photo on the right. And, choose the “Full-Length Standard” handles — these tuck beneath the Panels. Sub-Zeros come in a lot of different sizes, and they are all counter-depth. Using the exact specification listed above, I used a 42″ side-by-side Sub-Zero refrigerator-freezer in my kitchen, adding White Enamel panels for the front and for the sides. The place I ordered from had not taken an order like mine in years, but once I made myself clear, they understood — and got it right. Note, Sub-Zero’s website is not helpful in specifying “my” classic configuration. Use my instructions and be (with kindness and patience) insistent. Sizes typically used back in the day: I am sure the 42″ side-by-side has been around a long while. 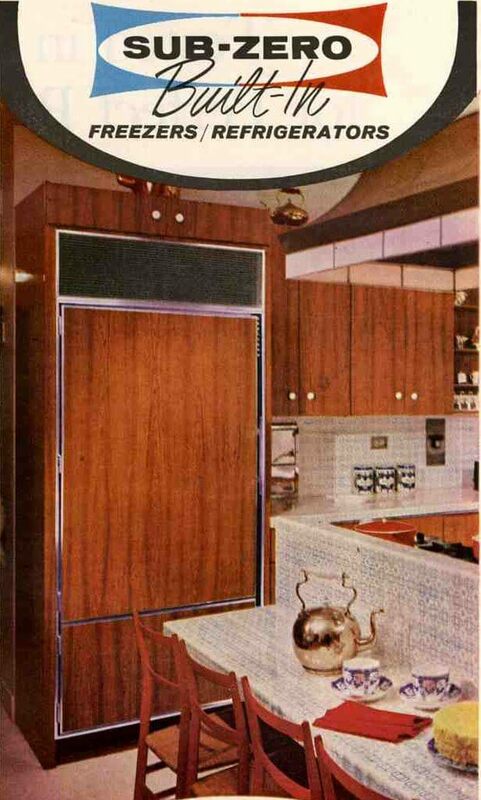 The image shown here is from a 1966 ad, and I would say that’s a 36″ wide refrigerator with small freezer on the bottom. Really, I think you could go with any size and be retro-appropriate. Final note: Sub-Zeros come with ice makers inside. Exterior ice makers are not appropriate for a retro refrigerator until you get into… the 1970s, I’d say. Big Chill is, arguably, the biggest name among homeowners looking for a retro refrigerator. And deservedly so: I think that they have done a really nice job with the design of their appliances. The lines are curvy and attractive, but not overwrought, not cartoonish. Nice. Big Chill has two different designs that speak to the postwar era — the Original, which has a 1940s into 1950s look … and the Retropolitan, which evokes the 1960s and 1970s. I also show the New Classic, if your aim is to channel iceboxes of the 19th century and early 20th Century. Storage for the retro refrigerator / freezer combinations: From 13 cu.ft … to 18.2 cu.ft … to 20.6 cu.ft … to 24.1 cu.ft. Depths of the “boxes” (not counting the protrusion of the door or handle) are 28″, except for the Slim Fridge, whose box sits counter-depth. Big Chill’s designs come in up to nine stock colors. Or, the company can paint your refrigerator a custom color at additional cost. What’s also great about this company is that they have a complementary line of retro ranges and stoves, cooktops, dishwashers, a microwave, and even range top hoods that are designed to help create a complete kitchen with a cohesive look. 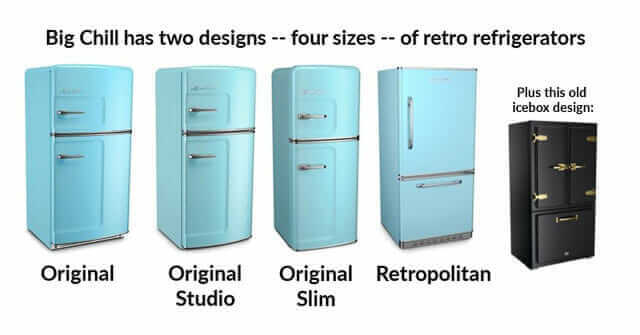 North Star, which is a brand of Elmira Stove Works, has a nicely designed retro refrigerator available in three configurations in the U.S. (Two additional slimmer models are also available in Canada.) These fridges come in nine standard colors, all retro lovely. And custom painting is possible, too. One of the things I like about these single-door refrigerators is that they are not enormous — they are 18.2 or 18.5 cu.ft. Refrigerators back in the day were not as big as today! That said, North Star also has two French Door models with a retro look, and one of them offers more space. The other French Door model has less interior space — but it is counter-depth, a nice option if you want your refrigerator to tuck nicely into your cabinetry. Storage for the retro refrigerator / freezer combinations: From about 18 cu.ft. … to 20 cu.ft. … to 25 cu.ft. We saw these retro cuties when we visited KBIS in 2016 — love that yellow! Kate with the Smegs at the big Kitchen and Bath Show in Las Vegas a few years ago.. I admit my head starts to spin when I look at the lineup of Smeg refrigerators on their website. They show something like 56 different models depending on the direction the door swings and the color. That said, there appear to be two basic designs: (1) A 57″ high fridge with an interior freezer compartment, and (2) a 75″ high refrigerator with a freezer on the bottom. They both are 24″ wide. So fundamentally, these are small-capacity refrigerators. I count 17 colors or exterior patterns (like flags) in the Smeg lineup. And, like some of the other companies on this page, Smeg offers some other products in coordinated colors so that you can have matchy matchy appliances throughout — dishwashers, ranges and hoods, dishwashers, toasters, tea kettles, blenders, and more. Single door Smegs hold 9.22 cu.ft. They are 57.5″ high … 23.5″ wide … and the boxes (sans doors) are 20-7/8″ deep. The fridge/freezer combos spec out at 11.7 cu.ft. They are 75”13/16 high … 23-39/64″ wide … and the boxes (sans doors) are 21-21/64″ inches deep. 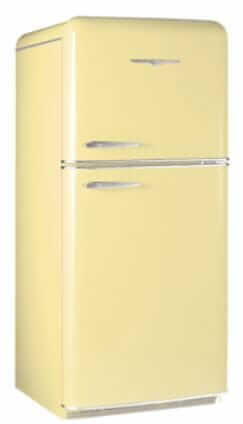 Note, Smeg also sells even smaller undercounter fridges that are also cutie petuties. More info to come! 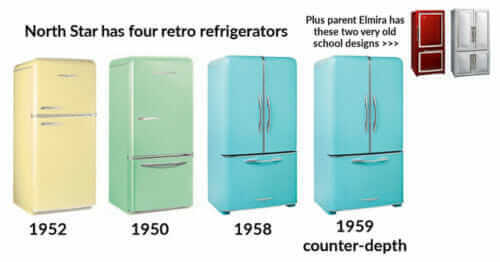 Reader Taylor alerted me to Chambers retro refrigerators, which currently come in two designs — (1) a refrigerator/freezer design and (2) refrigerator only. Yes: Chambers, as in the name brand of the famous maker of antique stoves. It appears like this revived name brand for appliances has been on the market about a year and more are coming. Thank you, Taylor, for the tip! Counter-depth, about 59″ high, about 24″ wide. Built to last: This vintage Westinghouse refrigerator that has been in constant use among one family since 1941! Over the 12+ years of writing this blog, I’ve met a number of readers who are happily living with vintage refrigerators. There are companies that specialize in repairing and/or restoring old refrigerators (and stoves). Be aware: Old products can contain vintage hazards — I am not an expert, so get with a properly licensed professional to assess what you are dealing with so that you can make informed decisions. Professionals also can advise you on energy use issues. Antique Appliances restores vintage refrigerators and maintains an ongoing inventory of refrigerator models ready for restoration and painting in the color of your choice. 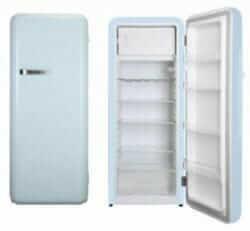 Antique Vintage Appliances is another company I found that says it restores vintage refrigerators. I don’t have a list of other companies that specialize in repairing and restoring vintage refrigerators, but you could also go through this list of companies that restore vintage stoves and see if they can help you with a refrigerator too. 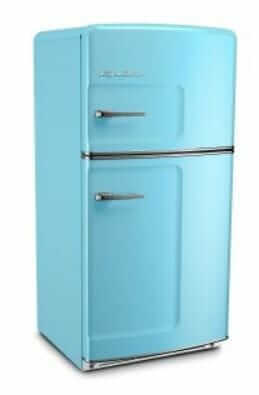 Painting an existing refrigerator a retro color can help you get the look at a potentially or relatively low cost. When I wrote about where to find red refrigerators, I talked about painting ideas and also got direct feedback from Rust-Oleum, a leader in paints. I again encourage awareness: If you’re stripping/painting, be sure to consider hazards possible in the layers – Be Safe/Renovate Safe. Take your plain-Jane refrigerator to an auto body shop or industrial painting place — Professional painting companies exist in virtually every town of size and can consult online paint color guides to match or help get you the color you want. Some advantages of professional painting include (1) they have access to very durable paints, (2) they will or should use environmentally safe practices, (3) they likely use dust-free booths to avoid itsy bitsies ruining your smooth glossy finish, and (4) someone else does it. 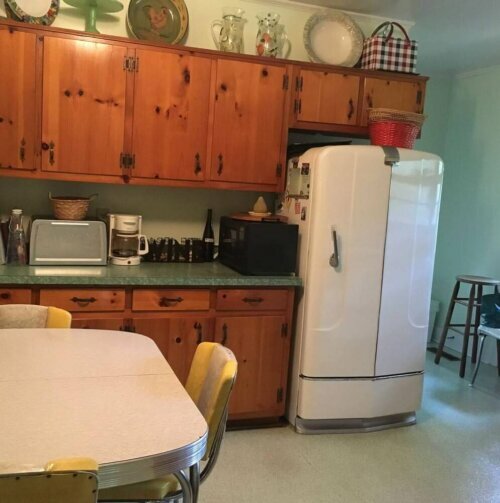 One key consideration, I’d say, is that many mid century kitchens were fairly small. Choosing a smaller refrigerator — including a counter-depth refrigerator — could make a lot of sense in terms of getting an aesthetically pleasing, suitable proportion. That said: Back in the day, I think folks shopped more frequently (grocery stores did home delivery! ), so a small fridge was fine, functionally. Fundamentally, a refrigerator is a machine for living, so of course, make the choice that makes sense for you! 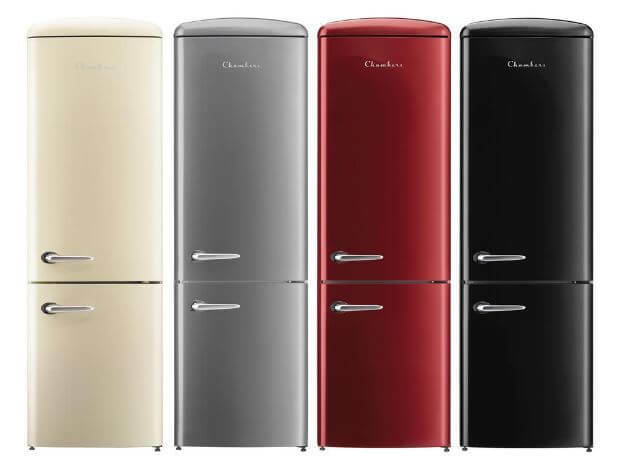 Which retro refrigerator is your favorite? Be sure to let me know if you discover others new to the market! Would have liked some pricing information with your perspective on value for money. I’ve priced these before and for the average homeowner, all of the options are pretty expensive. Hi Cherie, I understand what you are saying. I usually don’t list pricing, in particular because it changes, and so many of my stories are “evergreen” in nature. I also generally don’t try to tackle “value” because… (1) I am not an expert on the quality of most products — personally, I am a fan of Consumer Reports, because they do independent testing… and (2) when it comes to factors other than durability — like aesthetics — well, “value” is in the eye (and pocketbook, of course!) of the beholder. Some folks are willing to pay more for “a look” than others are. Finally, I am super aware that folks are looking for products at different price points. That’s why the last few suggestions relate to potentially lower-costs alternatives like painting or finding a proxy fridge that has the look close-enough but costs less (check out the comments, readers already piped in with a few!) Alas, those GE Artistrys had “the look” at a lower price point — but they were not on the market a long time. Thanks for your comment, I appreciate the opportunity explain. Hot Damn! on the Chambers!!!!!!!!!!!!!!!!!!!!!!!!!!!!!!!! I have a 1952 Chambers in copper finish that I had restored, it’s a wonder and a show stopper! If I knew about the fridge,,…. darn it I just got a new one a year ago… But next time! Hi, Pam — there’s one other option out there, which is a lot cheaper — the Galanz red retro fridge which is sometimes available from Home Depot. I have that one in my turquoise/red kitchen. It is small by modern standards, but actually just about perfect for a single person like me. I’ve been using mine for more than a year and I’m very happy with it. Galanz also has some smaller ones in retro styling, one of which I saw recently at Target. Availability of these fridges seems to be kind of touch and go, though.